Advent Calendar Day 7: Charity! The quintessential Christmas charity is probably the Salvation Army. Personally, though, I’m uncomfortable donating to the SA due to their historic (and contemporary) attitudes to LGBT people, and, of their militaristic, evangelical style of Christianity. Enough hate. Today’s window opens on other and perhaps worthier causes (chosen in entirely idiosyncratic and incomplete fashion by me) to which you might like to donate this Christmas! The Trussell Trust Food Banks: helping feed the 13,000,000 British people living below the poverty line. Birmingham Christmas Shelter, open to ALL across Christmas. Shelter’s Christmas Emergency: working to help the 75,000 UK children who will be homeless this Christmas. Kids Company – you can even buy a present for a Kids Company child directly, this year, by going to the wishlist (click “buy a gift” and then enter 525473). There’s everything from bibs and potties to cookbooks, craft kits, notebooks and bedding. Some people who are LGBT (and, I presume, some allies) find the “born this way” argument is offensive because it excuses, rather than validates a queer identity. For them,”born this way” implies that gayness/queerness should be accepted because it’s inescapable, unavoidable, and something that person can’t “help”. At best, the person “born this way” should be accepted by wider society, because that person’s sexuality is natural “for them”. At worst, someone “born this way” deserves tolerance because their queerness is not their “fault”. Further dread of the “born this way” argument arises from the possibility of research into genetic causation/correlation with homosexuality. If there is a gay gene, they argue, what good can come from knowing about it? Discovering a gene won’t accelerate real equality: tolerance on the basis of chromosomal inevitability isn’t the same as truly accepting diverse sexualities. Secondly, a “gay gene” is something for which parents could potentially “screen”, leading to the abortion of some fetuses with the gay gene. Thirdly, in a world where queers really were “born this way”, what would happen to people who lack the queer gene but identify as queer? I can follow all of the above, but personally – and with some shame, because questioning others’ sexual identity is, as one friend put it “very NO” – I find the anti-Gaga brigade unsettling. This is not just because of how the aforementioned Gaga looks in the underwear, sorry, prison sequences of the Telephone vid. Many (even most) of us do experience our sexuality – gay, straight, bi, pan, asexual, queer, whatever – as innate, natural and something we were born with. For us, part of coming to terms with our own sexuality and desire is accepting that we were “born this way”; it’s natural for us, it’s “part of who we are”. To many gays born before homosexuality was legalised and/or achieved a degree of acceptance, the idea that you’re not born gay is understandably offensive — the whole reason they persisted with difficult self-acceptance and coming-out was because they WERE born this way. They had no other choice. They fought for their rights; their sexual identity is hard-won, and to see younger queers saying otherwise – either that, like Cynthia Nixon, they “choose” to be a specific sexuality, or (more broadly) that they believe sexuality is fluid, playful, fun, a matter of jouissance – both denigrates that struggle and infers that those who “choose” to be gay could equally “choose” to be straight. An idea that many LGBTQ people know to be false, and at the root of problematic constructions of (e.g.) homosexuality as a “lifestyle choice” – LGBTQ Nation claimed that Nixon’s words would be “used as a brutal club against LGBT youth in Red State America”. I do experience my sexual orientation as innate. For a bit I definitely identified as bisexual. I’m not. I don’t think I was being dishonest when I thought that, but I don’t think it was accurate either (nor do I think it’s helpful of Nixon to claim to have “chosen to be gay” because “nobody likes the bisexuals“). It upsets me when discussions in queer circles (especially radical queer circles) invalidate the “born this way” position (along with other positions/wishes such as the desire for equal marriage rights). But then I tend to focalise how I see LGBTQ issues through an historical awareness – I have problems with straight people claiming the label “queer”. “Queer” was a slur against lesbians and gays: accordingly I’m uncomfortable with anyone using it in a reclamatory sense outside the group originally persecuted. In fact, I have problems with the label “queer” as an umbrella identity (i.e., when people use “queer” to mean “LGBTQ”/sexual identities other than straight) because I know that a lot of older gay, lesbian and bisexual people register the term as a slur and can’t feel part of it. I’d rather find new words and stay in a continuum with our history. This discomfort with vocabulary does make me twitchy in radical-queer-discussion-situations, but on the flipside I’ve always been lucky enough to know older lesbians and gays, and it’s an excellent payoff. I understand that other LGBTQ people don’t experience their sexuality as something innate, and as a choice, and that it goes against every tenet of equal rights to want them to shut up and prop up my arguments and identities, rather than embracing theirs. 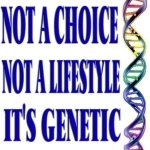 From experience, observation and my limited understand of genetics, I still think that most people do not experience their sexuality as a “choice” – coming-out, (hopefully) yes; behaviour, yes; orientation, no. But some do, and that’s okay (but baby, I was born this way. &c). NOW! Cousin-marriage is PROBABLY NOT THE GREATEST, given the potential for pre-existing abuse and future-existing webbed feet, hairy backs, genetic issues (&c – although we don’t veto other couples whose genetic combinations are problematic, do we?) to the power of however many times the pattern is repeated. Chinlessness may have made Britain great, but a quick glance around Oxford tells me we now have enough of it. ON THE OTHER HAND, the potential silliness, rashness and corn-chewing inadvisibility of pro-cousin marriage has NOTHING to do with the desirability of gay marriage. I understand the the impulse behind all of these graphics. I am a lover of satire and a believer in laughing stupidity into change. Neither do I mean to bite the hand that feeds me and/or my eventual right to marry. But I have a problem with the message that it’s wrong to say that gay marriage will threaten the “sanctity of marriage” because marriage has no sanctity left to threaten. 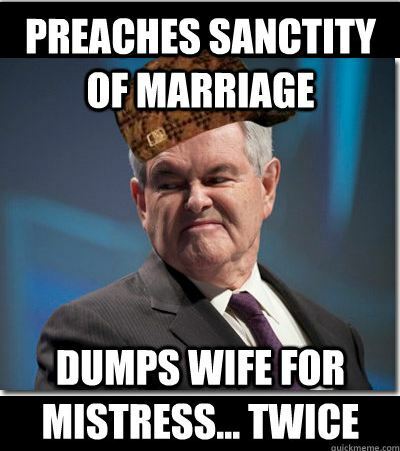 Equally, I reject the idea that Newt Gringrich’s pronouncements on “respecting the sanctity of marriage” are misguided or shouldn’t be heeded because of his track record. If every marriage since the dawn of time had been “sacred” – made in covenant with a deity, subject to vows which both partners believed and upheld at the point of undertaken, and utterly faithful and happy since – then that wouldn’t make gay marriage less desirable. Gay marriage isn’t “more OK” because the institution of heterosexual marriage is in a parlous state. The existence of 55-hour marriages, multiple divorces, bigamy, forced marriage, acrimonious custody battles, Las Vegas and the Kardashians does not create a precedent for gay marriage, not a matrimonial space in which gay marriage has the “right” to come and become joint-worst of a thoroughly bad bunch. Gay marriage is OK because people of all genders deserve the right to form loving unions of equal legal, social and religious validity, regardless of their individual physical or genetic make-up. Newt Gingrich’s shameful personal behaviour (while she was recovering from CANCER, people) makes his statements against the freedom to marry hypocritical as well as offensive – but he’d have no greater credibility even if he’d always been faithful. This post has been brought to you by Lady Gaga, Cynthia Nixon and discussions at the Oxford Queer Studies Circle earlier this year; not a bad combination. Popular movements such as breast cancer awareness are happily starting to reappraise the media used to send their message (go here for more on why all the pink games aren’t helpful, and a viral graphic that’s actually useful in raising awareness). 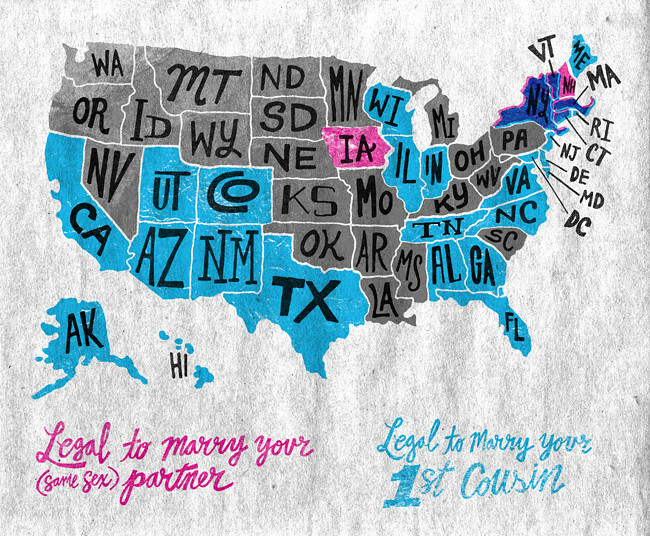 Obviously, gay marriage needs all the affirmation it can get. I still think it’s time to look more closely at some of the arguments that supposedly “support” our cause. Drama and Performance, English Faculty, seminar room A. Wednesday, 2nd November 2011, 5.15 p.m.
Everyone (undergraduates, graduates, faculty) with an interest in drama and/or performance is welcome, regardless of subject background. Wine and soft drinks will be served, and there’ll be the opportunity to go on to dine with the speaker afterwards. 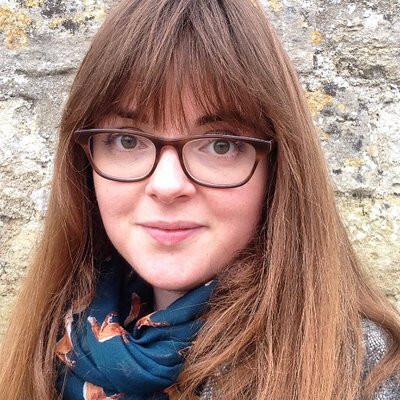 Convenors: Sophie Duncan (Brasenose), Sos Eltis (Brasenose), Laurie Maguire (Magdalen), Ben Morgan (Balliol), Emma Smith (Hertford), Tiffany Stern (University).